I was lying on my yoga mat this morning during the lovely, calm relaxation part at the end of the class, my mind wandering all over the place (as it does; I know, it’s not meant to…) and I started composing a blog post. Witty words came to mind, well-crafted sentences and astute observations. Yay! But by the time I’d driven home, clocked that the builders weren’t here again and that I’d missed a parcel delivery, it had all drifted out of my ears and off into the ether. I’ve not posted much lately because, well, I suppose I’ve just not been ‘feeling’ it. I’ve been a bit lost for words. Stuck. Put it down to post-holiday slump, school-holiday collapse, whatever. I’m usually brimming with words and photos to show you but I haven’t taken many recently and it feels a little as though I’ve lost my voice. I’m sure this happens to other bloggers every now and then, and I suppose I could wait until inspiration strikes properly, but it’s a new school year and I’m giving myself a shove – if I stop writing for much longer I suspect it’ll be even harder to get into the swing of it again. The yoga class was the first one I’ve been to for [whispers] seven weeks. Yikes. I did a little stretching over the summer but most definitely not the every-day practice that I aspire to. Whenever I’m asked at health-checks and the like whether I do regular exercise, I say that I do yoga and walk my dog. And I smile confidently. This usually passes muster and I get a tick in the ‘keeping fit’ box. 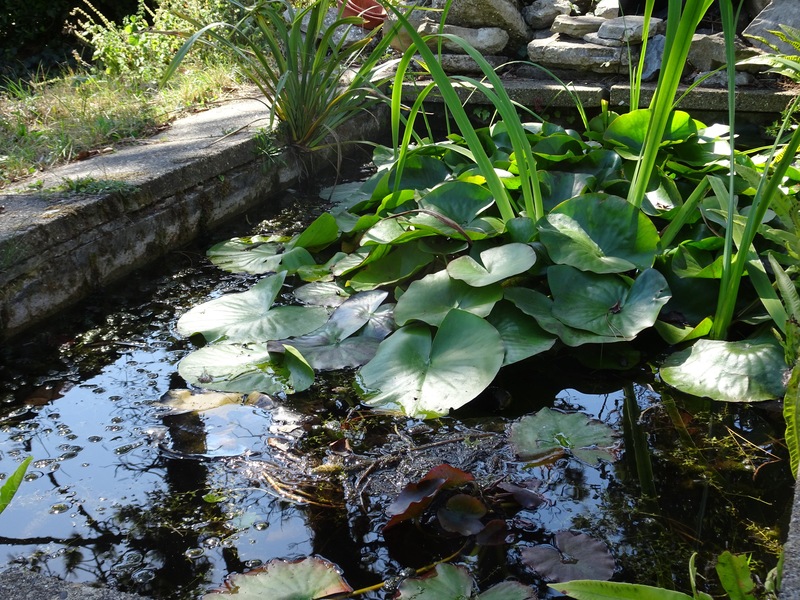 Gardening helps, as does rushing around looking after the house, etc, but I know that it’s not enough really. David is admirably/annoyingly fit. He’s a keen sculler and is on the water at least twice a week on the Thames at Twickenham, then he goes running most days when he’s at home. He’s trying to encourage me to get back in to running and to do a local 5k Park Run with him on Saturday mornings. I find his encouragement slightly irritating which says more about my attitude than it does about him! I did do some regular running a few years back and took part in the London 10k but instead of it spurring me on to greater distances, I crossed the finish line after 60 minutes, completely done-in, thinking ‘I… am… never… doing… that… again!’ When you’re in swing of running, it is a good feeling and I know I feel great afterwards, but it’s the getting going. Do you see a theme developing here..? Perhaps writing about it might give me that metaphorical boot up the bum. Another one. As well as my middle-aged body, the garden also needs some serious attention. I’ve been dead-heading and picking flowers and raspberries galore but there are definite signs of disarray. It’s been such lovely weather that in any spare time I’ve enjoyed being in the garden rather than working in it. We’ve had very little rain for a couple of months – only one day when it rained heavily – and some of the plants are suffering. The pond is also lower than I’ve seen it since we’ve been here. We’re on a water meter, so I don’t like to use mains water very often on the garden. We have kept the raspberries and tomatoes alive and I collect any leftover drinking water in a jug to chuck on the flowers outside the door but everything else has had to fend for itself. 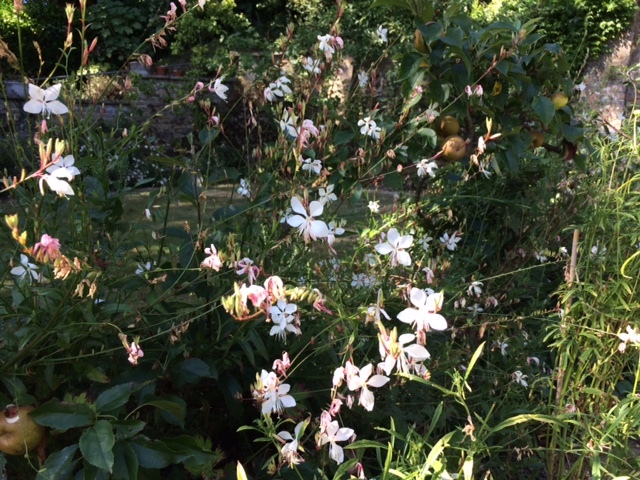 Ours are autumn fruiting raspberry canes and so easy to maintain – you just cut them right back to the ground each February and they fruit on the new growth in August-Oct.
It’s heartening to know I’m not the only one, CJ. 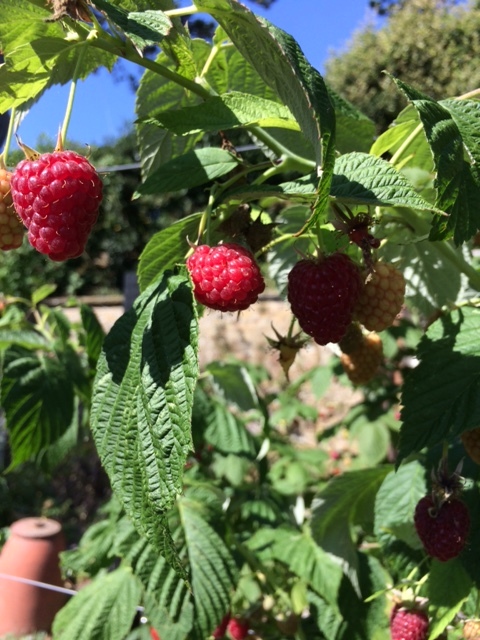 Hopefully we will be reinvigorated soon 🙂 I wonder what you’re doing to your raspberries… When you say picking, do you mean harvesting the fruit? I just pull mine off the calyx leaving a little stump behind. Or do you mean choosing the right one to plant? The best ones we have are ‘Joan J’ – I highly recommend these. Large delicious fruit. The raspberries we entered in the show weren’t judged because I hadn’t read the Show Tips and they didn’t have the calyxes still attached. Doh! Raspberry loaf cake sounds absolutely delicious! I’ve been in a similar writing slump. Nice to know I’m not the only one. It seems there are a few of us about 🙂 Hopefully it’ll pass soon. It was lovely to read your post Sarah. I’d been wondering where you’d got to 🙂 Hope to hear more from you again soon. This seasonal slump seems to effect quite a few of us, maybe it’s the opposite of sap rising in spring? I have such a long lists of stuff I should have covered by now but am finding it hard to muster the enthusiasm …. Your raspberry cake and jam look/sound delicious. Ha, yes, I like that 🙂 I’ve been eating far too much cake lately. Perhaps that’s exacerbating my slump! 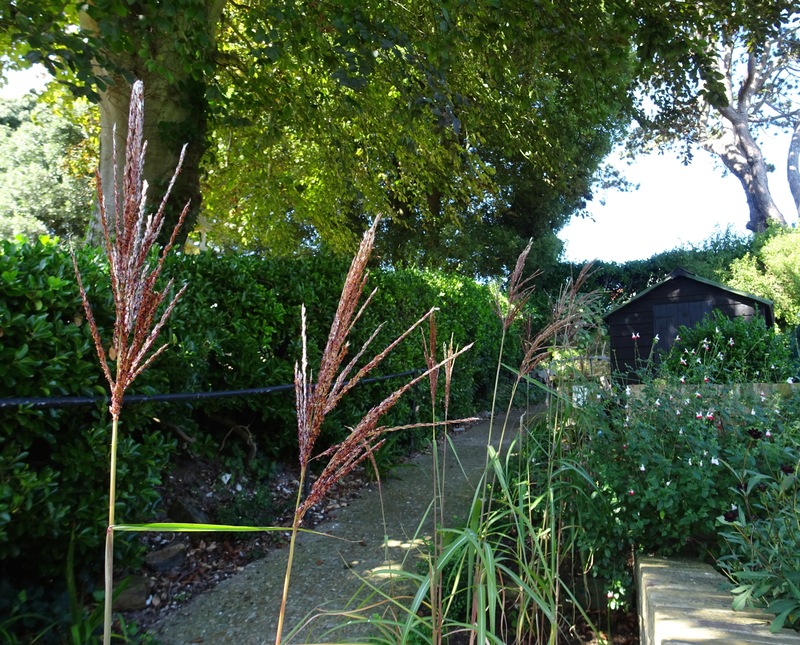 I think part of the problem is that it has been so dry and the garden in September does ‘ t inspire the same starry – eyed enthusiasm as in spring or early summer. Yes, there are plenty of flowers, but not the sort that make you want to grab a pen and write odes, sonnets or even passages of purple prose. I found myself featuring a randy vicar in my last post. It’s shameful; on a gardening blog I should really have been writing about my dahlias. That raspberry cake looks delicious, can we have the recipe please? 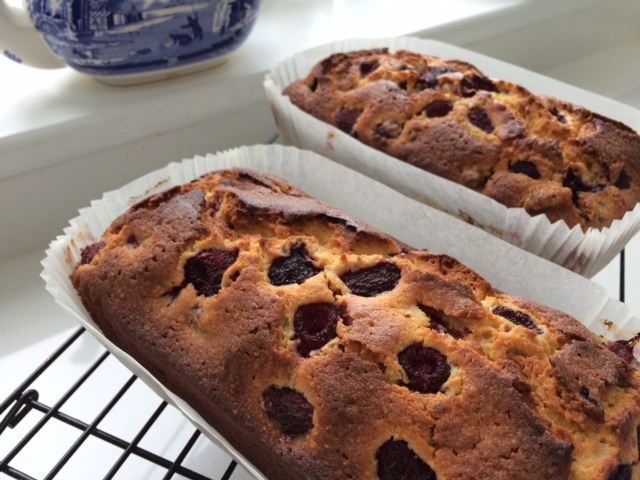 There should be a link to Anne’s recipe if you click on the Raspberry Loaf Cake. I’ll double-check. I know we shouldn’t complain about sunshine and heat but I am looking forward to cooler days and getting out my wooly jumpers – I’ve had enough of the heat now (although it is good for the bees, etc). I’ve been feeling the same slump. Maybe it’s because I don’t have any children in the educational system any more so don’t have the same dramatic start to September. I shall have to organise my desk and pretend I’m starting a new term and maybe my brain will start to work properly again. Really enjoyed reading your post, Sam, as it clearly came from the heart and told it exactly how it is. I will definitely look out that raspberry cake recipe too! Good luck with the jam and other entries in the show – I haven’t entered a show since I was a child but reading about other bloggers’ entries makes me want to give it a go soon. Will have to investigate for next year! ps are your and David’s rasberries fom the same canes? Who gets first pick?! We picked a load of raspberries and put seven on each plate – they were disqualified because we hadn’t kept the calyxes attached… Schoolboy/girl error! 😦 but at least you will know for next time! I think in the summer there is many other things competing for our time. Reading your blog you seem to be very active, yoga is very good at keeping the mind and the body healthy. 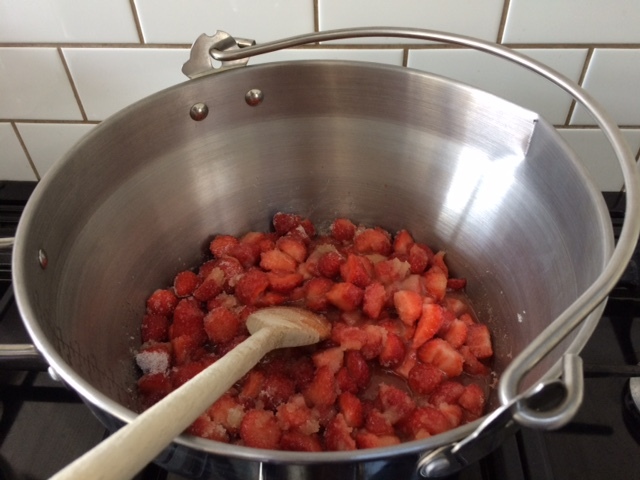 Too many raspberries is a problem I wouldn’t mind having at all – they are my favourite fruit! Raspberries are my favourite fruits, so thanks for the delicious cake recipe. I had to laugh at your description of doctor’s interogation about exercise, since I say much the same about classes and dog walking (except pilates instead of yoga) and I know that a lot of the class I spend lying on my back too! Your post are always entertaining, so well worth the shove. Your lovely post exudes that end-of-summer softness. You sound like a bee who has had a laborious day! Rest a while on your laurels! It’s tempting to sit there often and gaze at the sea. Not conducive to getting work done! Oh, how I would love a surfeit of raspberries. Actually, I’m not sure a surfeit is really possible. I too am sometimes driven mad by having just the perfect turn of phrase pop up, then escape through the sieve that is my mind. It’s infuriating isn’t it? I often wish I had a notebook with me but I’m usually walking the dog, driving or lying on my yoga mat when I have my ideas. 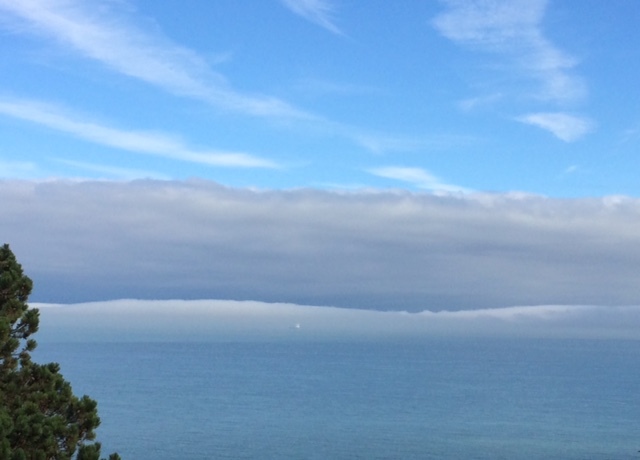 The cloud in the first picture looks like the tubular clouds we get over the ocean here. They look like wool ready for spinning and fascinate me. And that glass teapot (?) in the fifth photo is exquisite. I want one. 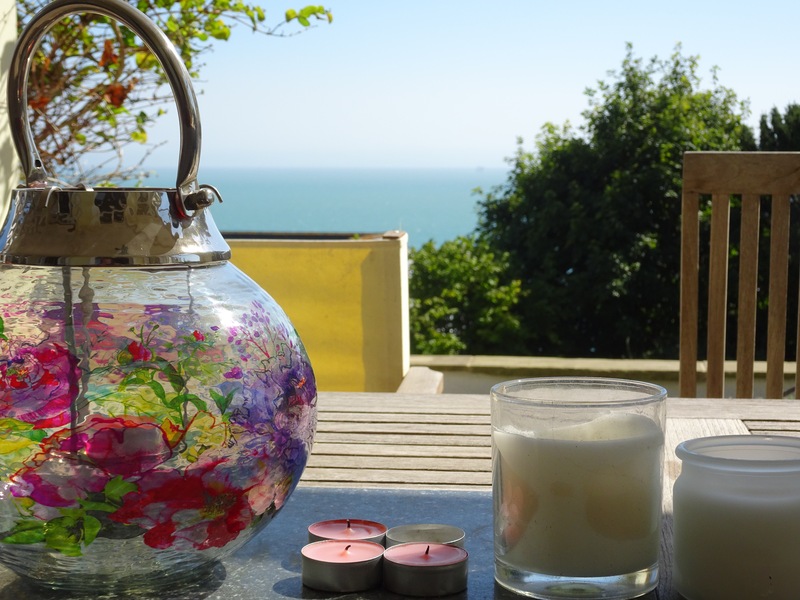 As far as blogging inspiration, it should ebb and flow don’t you think? Just as other things do in our lives. And for exercise, to my mind, nothing but nothing beats walking. Any age, anywhere, any weather, any clothes, you can always walk. I enjoy all kinds of exercise (especially yoga), but walking has been my constant life companion. I hope to be hobbling on down the road until I die.